At The Loft- Our Weekly Update is Here! After an educational weekend at the Chicago Midwinter meeting, the Sugar Fix team is excited to be back at The Loft! We had an incredible time together bonding and learning. We are implementing all of our new ‘take aways’ or ‘pearls’ and helping all patients with their dental wants and needs at The Loft! 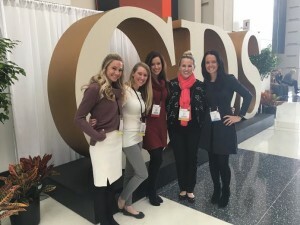 Team Sugar Fix at Chicago Dental Society’s MidWinter Seminar. 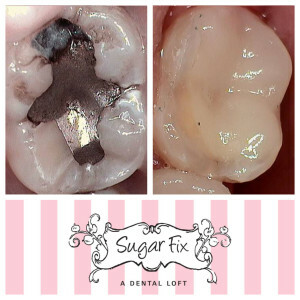 Below is a Sugar Fix Dental Loft patient who came in with a tooth that had been injured as a child and caused discoloring. Even the temporary looks amazing compared to the before picture. The patient was so happy about her decision to fix this problem tooth of hers. In two weeks we will have the final porcelain restoration to deliver and we could not be more excited for her! 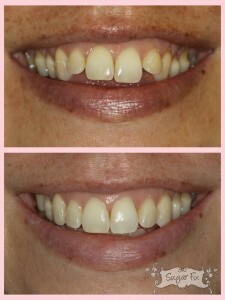 One of our patients came in for her final retainers for Invisalign. As you can see below the of her treatment are amazing! 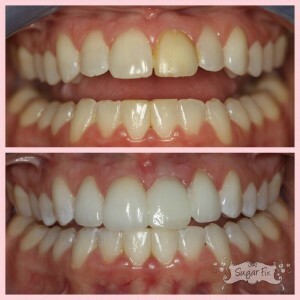 She had a full treatment of 28 trays. That may sound like a lot, however, each tray is only worn for 2 weeks and that adds up to only 14 months of treatment! Traditional orthodontics usually last anywhere from 1.5-5 years! Before Invisalign (above) and after Invisalign (below). Our Cerec….thank goodness for technology! Our office was in overdrive with milling out Cerec’s this week. Here is another great example of what our amazing Cerec machine can do! A large silver filling is removed with this great same-day restoration. Patients are so happy we have this technology to do same day restorations and not have to wear a temporary for two weeks. We love it too! Old silver filling (left) new Cerec restoration (right). We had a bittersweet celebration with one of our patients that we have been fortunate enough to serve for 7 years. He is moving to Boston next week and will be truly missed! Dr. Emery will be sure to meet back up with him at some point when she is back in her beloved hometown. We say “until next time” to a long-standing patient of ours. Construction is all abuzz around the Sugar Fix Dental Loft neighborhood. This is exciting but also a bit disruptive. Please allow a little extra travel time as parking is limited due to road closures and reroutes. 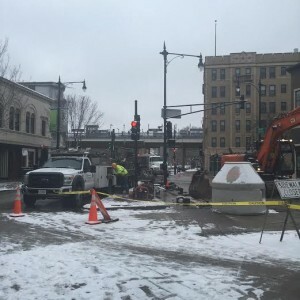 Loads of construction happening all around our neighborhood! Until next week! Happy Weekend!